My interest in radio, as with many other dxers, began in the mid 1960 with the introduction of offshore pirate radio around the UK, but by the 1980s my interest in pirates and shortwave broadcasting had receded a bit, and having just gained my Amateur Licence I started to look at other aspects of the hobby. 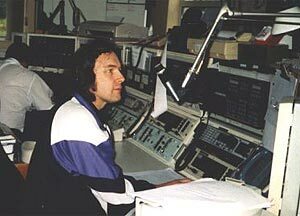 I'd become very interested in Medium Wave Dxing, espcially UK local radio, which was continuing to grow at that time, and in the 1990s a new form of radio appeared in the UK - the Restricted Service Licence, or 'RSL' as it was then known. The challenge of hearing station transmitting just one watt really appealed to me, and for the new few years I spent a great deal of time searching for and QSLing both MW and FM RSL stations. In 1993 the UK's first football club radio station came on air at nearby Premier League club Blackburn Rovers, and this was soon followed by another one at the mighty Manchester United, and several other fairly local football clubs. In 1995 I heard a test broadcast from "Radio Latics" operating on 1386 kHz from the most local of clubs Oldham Athletic AFC, and duly sent off a reception report. Several days later, and much to my surprise, I received a phone call from the manager of the station, he had looked up my number in the telephone directory, and never having seen a reception report, or heard of "dxing" before decide to call me and find out more about it. The station was operated for the football club by members of the nearby Hospital Radio Station, Radio Cavell. To cut a long story short, I was invited down to visit the station, an offer which I was only too happy to accept. During my visit I took along my trusty Sony 2001D and a small portable MW loop and for the benefit of other Dxers explained a bit about how it all worked. I was invited to come along to the next broadcast and go on air to give listeners some advice about improving their reception. This I did, and it was probably one of the most nerve racking things I'd ever done - a natural broadcaster I am most definitely not! At that time the station was operating with a temporary aerial and transmitter, but plans were afoot for a permanent installation to be purchased. At this point my background in Amateur Radio and electronics came to the fore, and since the station didn't have anyone with RF or aerial experience they just sort of kept me. I didn't mind this at all, and I was only too happy to help contribute to all the rest of their broadcasts. I must admit that the next few years were really fascinating, with not only having the opportunity to visit many of the other UK Football Club Radio Stations, but to photograph them as well. If I can ever find the time I plan to put all these on the internet somewhere. Radio Latics didn't survive due to the financial problems at the football club, but that didn't stop Radio Cavell, and we operated many other succesful RSL stations such as "Heartbeat Radio", "VJ Day Radio", and the "Voice of Oldham", and I had some great fun operating the Outside Broadcast Links (but that's another story!). With the advent of the long term RSL licences Radio Cavell was awarded a 5 year licence and allocated the frequency of 1350 kHz. Due the the vast increase in the number of these low power stations it's now much harder to here us than it was in the old days, but we do continue to receive a number of reports every year. In our 7+ years of broadcasting we have probably received well over 100 reports, with the vast majority coming from Scandinavia. We've also been heard in Germany, and the Netherlands too, and it never ceases to amaze me just where our one watt of RF will get out to! The downside of my involvement with radio broadcasting was that it totally destroyed my interest in sending reports to MW and RSL stations, I think this was because seeing things from the "other side" destroyed all of the magic and mystique which it had previously held for me. I'm still the QSL Manager for the station, and I love to receive reception reports, but personally, all of my own dxing nowadays is related to utility radio monitoring, especially that of Non Directional Beacons, which has been a lifelong passion of mine, and aero and marine stations.